Some of you may have heard that King Avenue was in the preliminary stages of planning a capital campaign. There are both expensive brick and mortar concerns that must be addressed and missional/outreach ministries which will enhance our future. 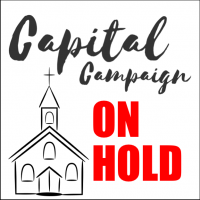 Because of the confusion created by the recent General Conference, the Capital Campaign Committee decided to pause the campaign. Our consultant Lori Overmyer with Goettler Associates met several times with the committee, prepared a campaign case document, and interviewed several members for input. The information which was gathered indicated that now is not the best time to proceed with a major fundraising effort. Once the dust of General Conference settles and our future direction and affiliation is clear we shall resume the campaign. In the interim we shall keep you informed of King Avenue’s immediate needs in the present. If King Avenue is to remain a leader in inclusive, reconciling ministry, we must resume the campaign. Not to do so, would be to take a major step backward. If you would like more information or have questions, contact John Keeny, jkeeny@kingave.org, or Colleen Ogle, colleen@kingave.org.